Syllabus of the Online Course (Subject): Black Sea Economic Cooperation (BSEC) - Europe. In 1992, Armenia, Azerbaijan, Bulgaria, Georgia, Greece, Moldova, Romania, Russia, Turkey, and Ukraine created the Black Sea Economic Cooperation. 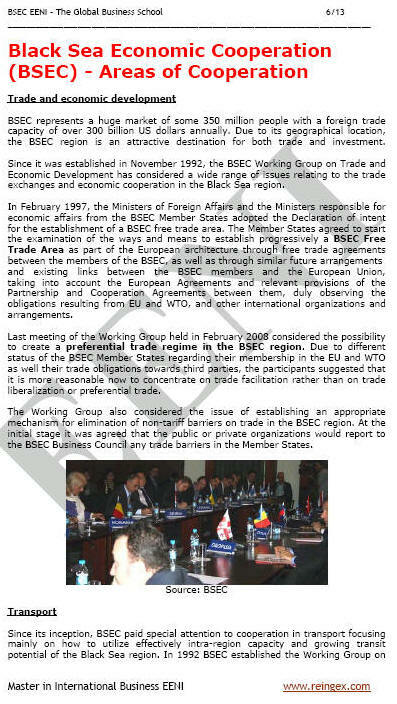 In 1999, the Organisation of the Black Sea Economic Cooperation was transformed into a regional economic institution: The Organisation of the Black Sea Economic Cooperation. The Black Sea Trade and Development Bank is an international financial institution formed by Albania, Armenia, Azerbaijan, Bulgaria, Georgia, Greece, Moldova, Romania, Russia, Turkey, and Ukraine.